MORE ROOM TO BREW (SOME GOOD TIMES). Local favorite Lazy Monk Brewing opened their new tap room on Jan. 8. 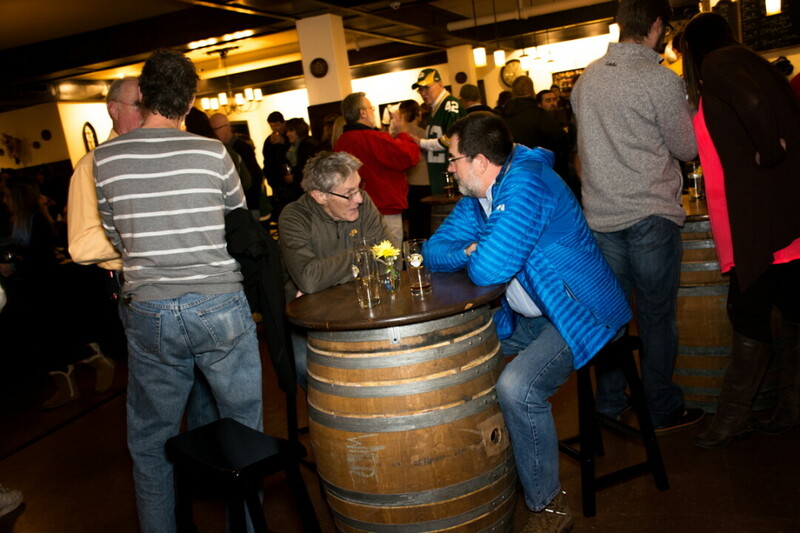 The new location of the Lazy Monk bier hall officially opened on Jan. 8. The 5,000-square-foot space at 97 W. Madison St. (at the corner of Madison and Oxford streets) has something for everyone, and in a great convenient location on the West Bank of the Chippewa River. Owners Leos and Theresa Frank are excited to be one of the first new businesses in a neighborhood on the cusp of a major redevelopment, and they are looking forward to the increased visibility of the new location, formerly Charlson’S Building & Design. They’ve outfitted the interior to look and feel like a traditional German or Czech bier hall, with custom-made curtains from the Czech Republic, tons of woodwork, a fireplace, and things they’ve brought back from their numerous visits to friends and family in Europe. 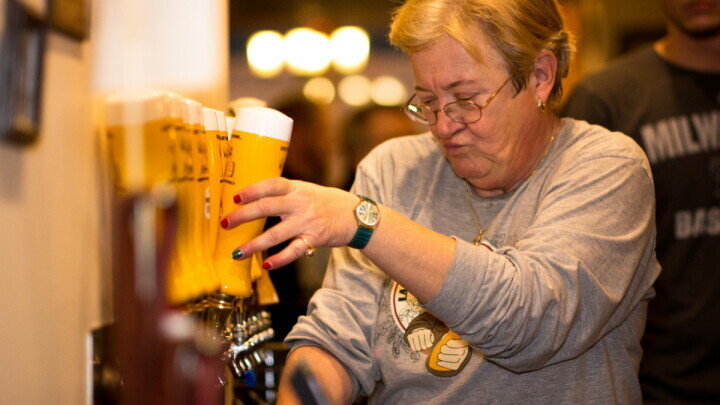 “We have paid close attention to the small details you will find in any bier hall in Europe, which we feel our customers will appreciate,” Theresa said via email. The bier hall vibe extends outside, to the 25-foot-by-50-foot deck overlooking the river. The deck will seat up to 99 people and provide patrons with a three-season German bier hall experience. One tap will feature hard lemonade, another is saved for root beer, and the remaining taps will be pouring the products of other western Wisconsin microbreweries. “We feel it is important that we all promote other breweries and can’t think of a better way than to have them on tap,” Theresa said. In addition to the tasty beers, the Franks will be serving up some delicious German-style food in the coming months. (The Lazy Monk is currently in Phase 2 of the move; food arrives at Phase 3.) They plan to serve a selection of four to five items of Czech or German food daily. No pizza, burgers or fries here. Authentic comfort food only. Until then, on Saturdays you can still get fresh-baked German-style soft pretzels made by Ursula’s Pretzels in Chippewa Falls. 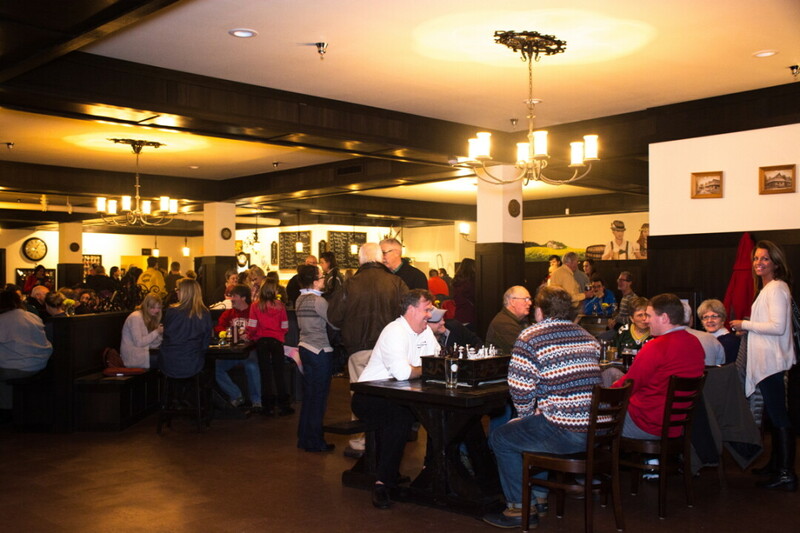 The Lazy Monk is family-friendly, so feel free to bring the little ones to enjoy the rustic interior and root beer. Canned sodas and bottled water are also available. Pick up a T-shirt, mug, beer glasses, or other Lazy Monk merchandise while you’re there. “We hope to provide Eau Claire with a unique space to enjoy a little taste of Europe in their own backyard,” Theresa said. Prost! The Lazy Monk taproom is open Monday-Thursday 3pm-10pm, Fridays 3pm-11pm, Saturdays noon-11pm, and Sundays noon-8pm. The bier hall will officially celebrate its grand opening on Friday, Jan. 22, and Saturday, Jan. 23, with free prizes, a raffle for Mug Club memberships, and more. Visit lazymonkbrewing.com. Eau Claire's Lazy Monk Brewing unveiled its new taproom – part of its all-new building on Madison Street in downtown Eau Claire – in a soft opening on Friday, January 9.